Friday - the space for joy, offers hostel service for new new generation. Our doors are always open to creative, active and cheerful people. Want to change the world and add bright colors to life? Friday Hostel is the right choice for you! 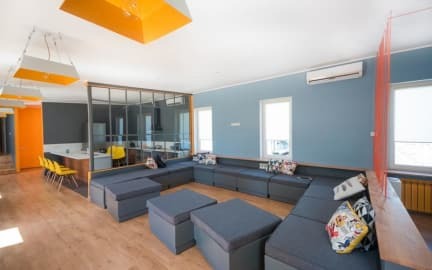 Friday Hostel is situated in Odessa, 600 m from Spartak Stadium and 1.5 km from Chernomorets Stadium. Odessa Theatre of Opera and Ballet is 1.6 km from Friday Hostel, while Deribasovskaya Street is 1.6 km from the property. Central Airport is 7 km away. Rooms in Friday Hostel are beautifully decorated to ensure maximum comfort during your stay. The property features free Wi-Fi throughout the property. There is a 24-hour front desk at the property. The hostel also offers bike hire and car hire.